One of the fastest growing mobile game networks is Google Play Games APK 3.7.23. As prominent developer, Google wants to contribute in advanced mobile game. This app can be installed on Android based mobile phone or tablet. It is free, so you can just go to Play Store then install it immediately. There are several advantages on this app that make users can enhance their capability in online gaming. With this app, you can play many games and share with others. Generally, Google Play Games is not only standalone application that allow user to play game with same platform, but you are also able to connect with other device then play real time game simultaneously. The main question for beginner is how this app works. You need internet connection to begin playing the game with others. When go to front interface, user will find much useful information. It uses cloud platform, so you can continue the last stage on certain game that left some times ago. The most interesting part is the multiplayer features. As it mentioned before, user incorporates specific environment to play game at real time mode with another person around the world. Leader board will show who get the highest score and any information such as stage, level, group, etc. Google launched this app officially in 2013. Actually, this thing is app and SDK version for third party developers. If you are game developer, this platform will let your game played with many users. Based on recent data, more than hundreds Android users have been installed this app. Another benefit is synchronizing and integrated system with other Google app. Thousands of games has been launched via this platform, so users can pick whatever they want. You do not have to bother to play the game one by one that spend too much time just to login to different account. Google Play Games for Android is the right app to spend time with various games. New! Gameplay Recording: Easily record and share your best gaming moments from your favorite mobile games. 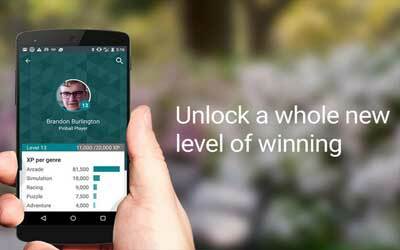 Game Profile: Earn XP and level up as you master games across Google Play. Saved Games: Pick up right where you left off, from any device. Achievements & Leaderboards: Complete challenges, earn awards, and track them all right from the app. Then, see how you stack up against other players.